I love Chinese food, and we eat it every now and then - not as often as we used to, since we're now pretty far from our favorite take-out place. Still, I cook a bit myself - maybe not authentically Chinese, but I don't let that bother me. Coating the chicken in egg whites and corn starch make it crispy and crunchy - a small extra step that adds a lot of impact. You can vary the veggies as you see fit, or according to seasons, and feel free to play with flavorings as well. A bit of citrus zest would definitely be good! Whisk the egg whites with corn starch, salt and pepper. Add the chicken and make sure it's well coated. Cut the snow peas and asparagus into bite-sized pieces. For the sauce, stir together corn starch and water. Set aside. Fry the chicken in hot oil, in batches. Remove to a plate. Fry the veggies with garlic and ginger in some oil. Add sugar, soy sauce and the water and corn starch mixture. 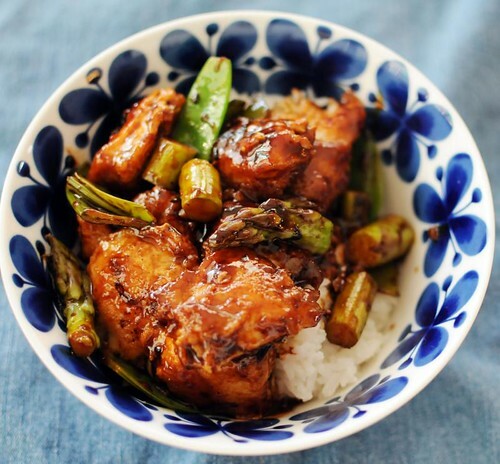 Bring to a boil, add the chicken, and season with chili and more soy sauce. Serve over rice. p.s.-- The cookies and bulgur salad you posted earlier are also amazing! I am definitely going to try both out soon! This really does look tasty. The kind of recipe that make my Mats say ooh when I tell him what's for dinner! What do you mean by chili? Chili paste? Chili powder? Ah, sorry - I used chili powder.